Eltronicschool. 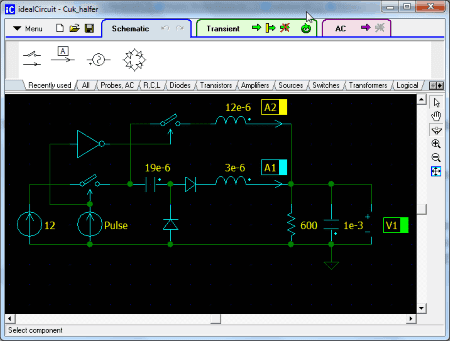 - This is one best free analog circuit simulation design software that called with idealCircuit. This software will let you design analog circuits pretty easily. Apart from designing, you can also simulate a circuit to view its output. The UI has 3 different tabs: Schematic, Transient, and AC. In this time, we will give you global description about this idealCircuit software and then we will give you the link to download this idealCircuit for an Analog Circuit Simulation Design for Windows from original source. This is idealCircuit Free Download for an Analog Circuit Simulation Design for Windows for you. According Listoffreeware site describe that idealCircuit is one of the best free circuit design freeware. The interface lets you design analog circuits pretty easily. Apart from designing, you can also simulate a circuit to view its output. The UI has 3 different tabs: Schematic, Transient, and AC. Design circuit in the schematic tab, view the transient output in the Transient tab, and view AC parameters in the AC tab. The components to design circuit are available in different tabs where you can choose from a list of: Voltmeter, Ammeter, AC source, Resistor, Capacitor, Diode, Transistor, Amplifier, Switch , Transformer , and Logic Gates. The best example is an ideal switch, with zero resistance when closed, infinite resistance when open, and instantaneous switching. Another example: an ideal diode with similar properties. All other components might be not as "ideal" as switch and diode, however they are also simplified to provide just a basic functionality required for component of that type. With ideal components, engineers can evaluate a general concept and prove the feasibility of the design very quickly, leaving thorough and detailed analysis to standard SPICE-based tools. Students can simulate exactly the same schematics they see in the textbooks: no need to select a specific diode or amplifier from the list of thousands of parts. And now you can click the link below to take free download idealCircuit for an Analog Circuit Simulation Design for Windows from original source easily.